As you may or may not know, Internet Explorer 9 has been released. It's the latest Microsoft product, and unlike most of those, it's actually really good, the first decent browser to be whelped out of the Microsoft womb. Whether it gives Firefox, Chrome and the rest the run for their money or the hobble for their gold is a matter of heated, endless, pointless, and unsolvable debate. Rather than focusing on prophetic obituaries, I'd like to give you another review of the browser, which should complement my earlier testing quite well. Internet Explorer 9 Beta was quite lovely. Is the final product just as good? Went smoothly. The installer asked me to close all running applications, then it backgrounded the Explorer and ran. The installation completed without a need for reboot, which is an improvement. If you have ever used any of the earlier releases of Internet Explorer, it's like trading a car with automatic gearbox for the proper manual one. Things get all of a sudden revvy and exciting. Internet Explorer is quick; quick to respond and quick to render. It may not be as blue-blooded as its rivals, but this is a major, positive step for Microsoft. As opposed to, what, androids? Robots? Funny, eh. Overall, the browser worked well. No glitches, no crashes, no annoyances. It did what it was expected to do. 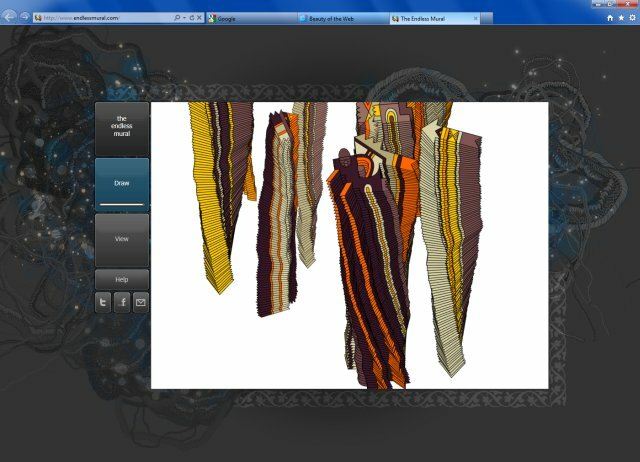 I also tried some of the recommended HTML5 sites, which demo the technological leap, indeed, Internet Explorer 9 behaved. Configuring the browser is also fairly easy. Right-click and enjoy. 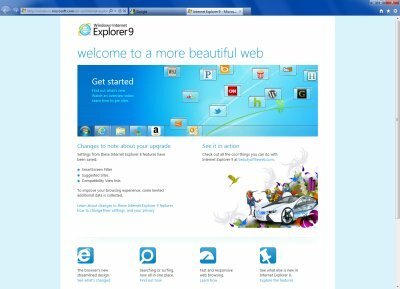 You can easily get back the overcrowded old looks if you needed, although Internet Explorer 9 looks best simple, minimalistic and slick. There are a few things that Internet Explorer 9 is missing. 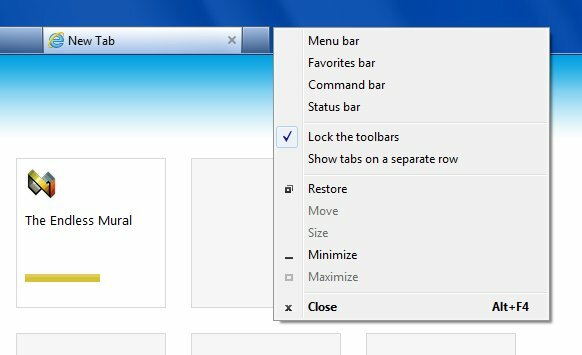 The ability to quickly and easily find and install free, high-quality and crap-free extensions has never been the strong side of Internet Explorer. Worse than that, there is NO Internet Explorer 9 for Windows XP users. Now, considering the fact that latest versions of rival browsers are available for the aging Microsoft operating system, including hardware acceleration, this looks like a big mistake. Windows XP still hold some 60% of the desktop market share, so I can't figure out the decision. One more item that annoyed me a little is that if you close the last tab in your browser, the whole thing closes. After being used to Firefox and Chrome, where this is either impossible or leaves a blank space behind, you might be surprised by Internet Explorer closing on you. This is a short review, but then I did a very long once when testing beta, so please take a look over there. Bottom line, Internet Explorer 9 is a good product. It's stable, robust, fast, compliant, and behaves like a modern and capable browser. Will I be switching? No. But if you are already using Internet Explorer, then please, by all means, test this new thing and see how it works for you. For Windows XP users, you must either stay with Internet Explorer 8, which is quite bad, or try one of the latest Firefox or Chrome builds, which you should be doing anyway. However, for Windows 7 users, the upgrade is a good and smart change. Anyhow, even if Microsoft Internet Explorer 9 does not capture your heart or make you switch, it will surely put some wind in the Mozilla and Google sails, and that is always a good thing. Competition breeds quality, as this browser release is a clear evidence of. We might expect even more goodies coming in the future. Internet Explorer 9 gets 8/10. Recommended, but not a hopper maker.